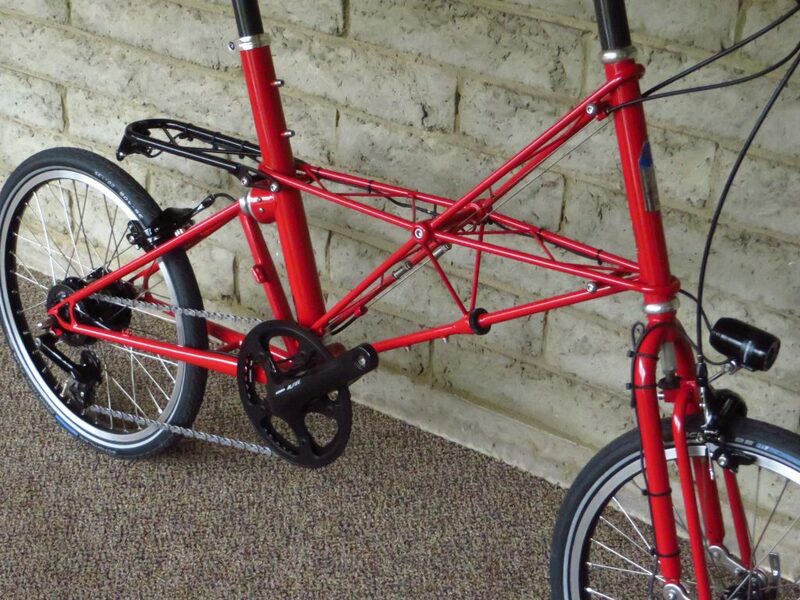 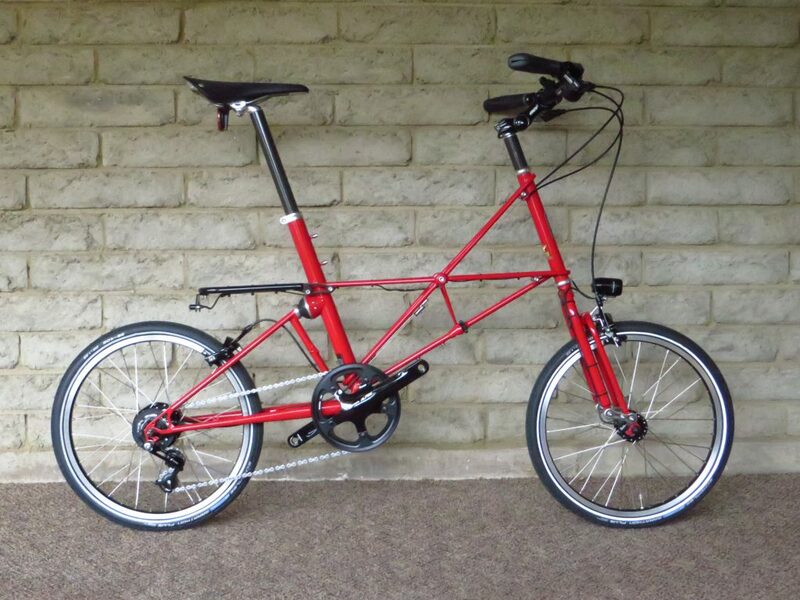 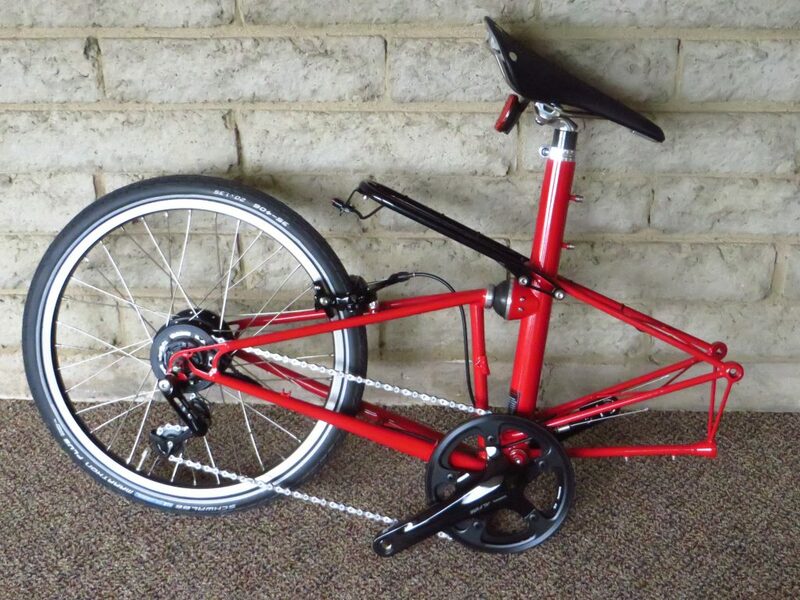 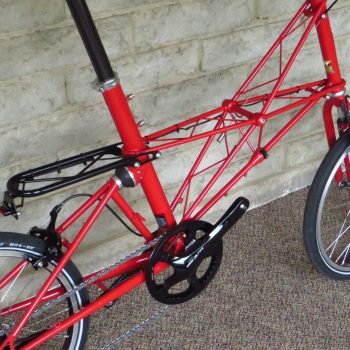 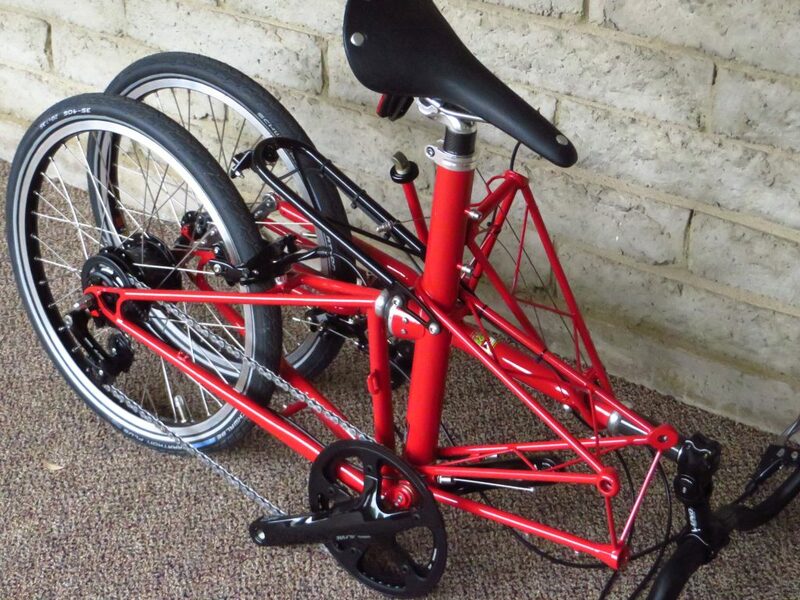 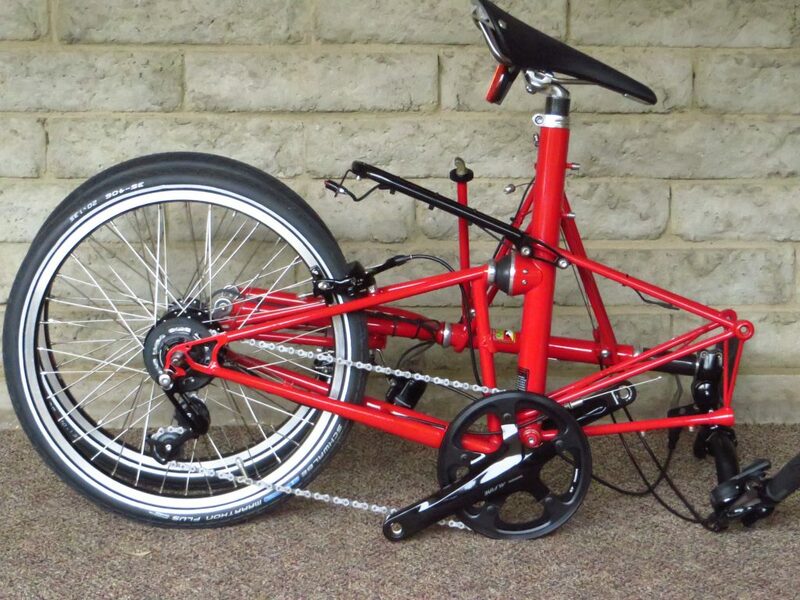 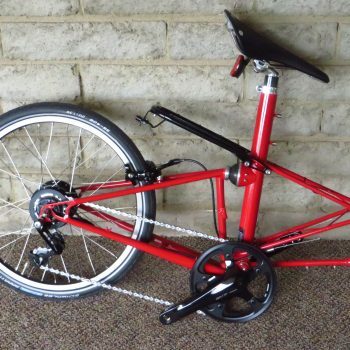 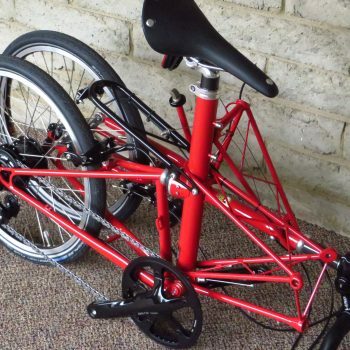 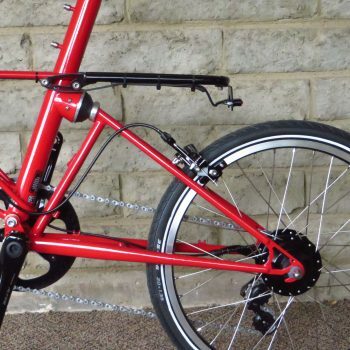 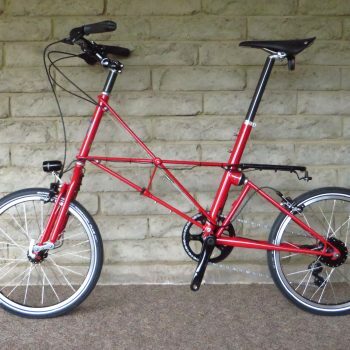 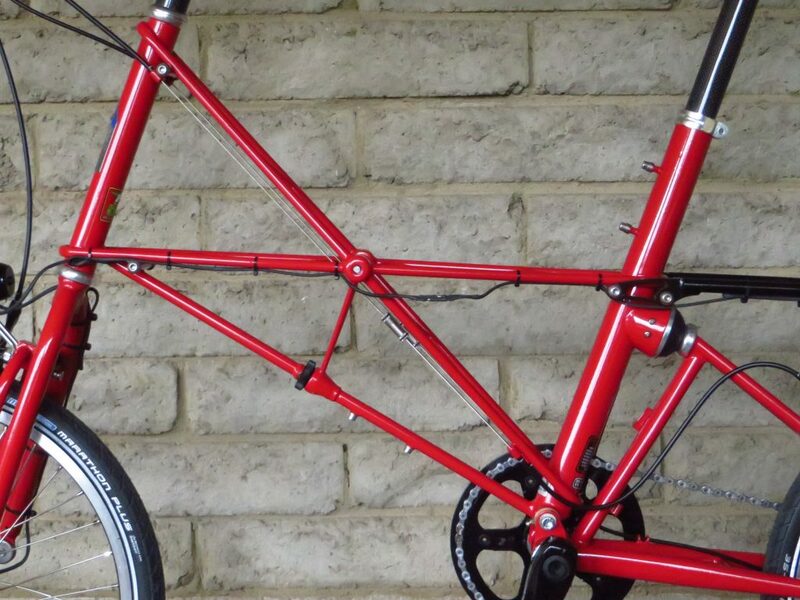 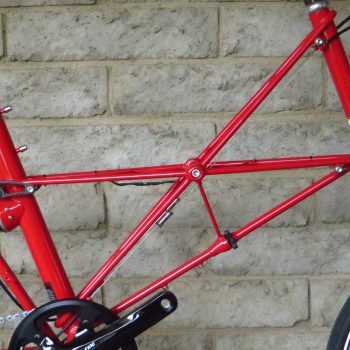 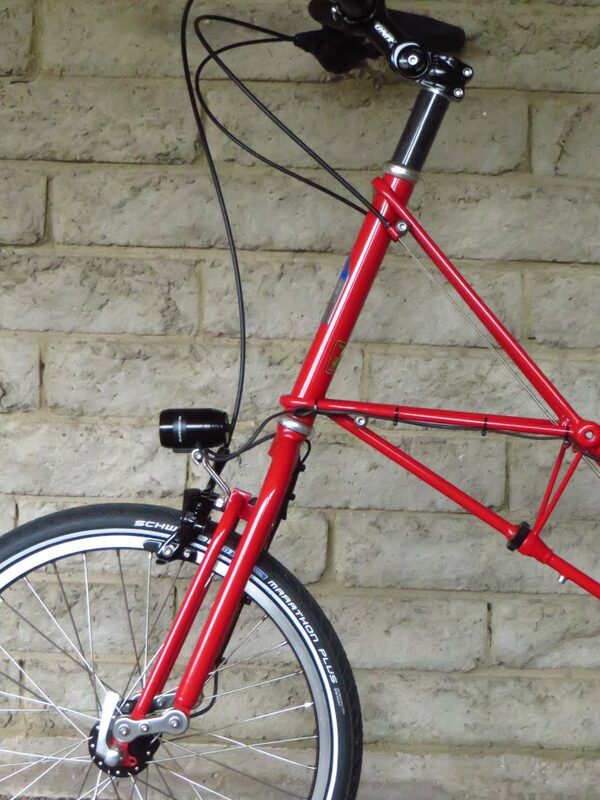 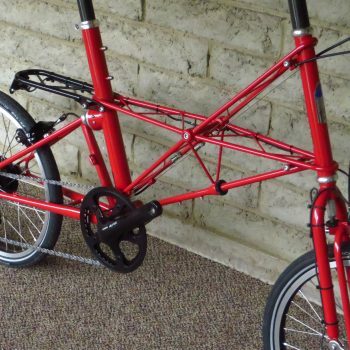 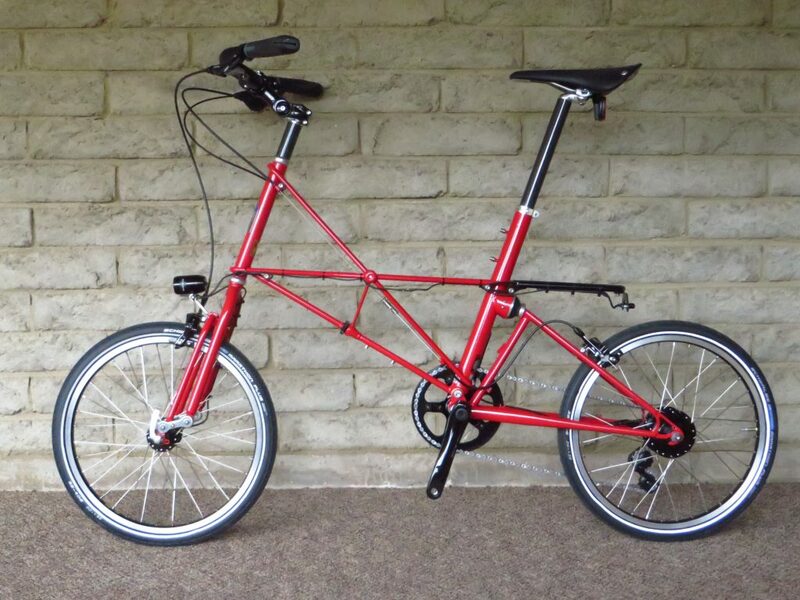 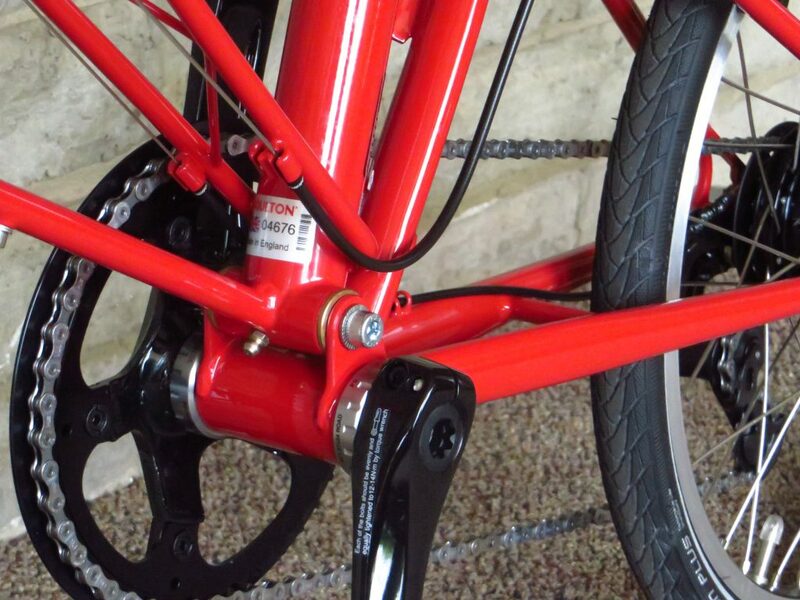 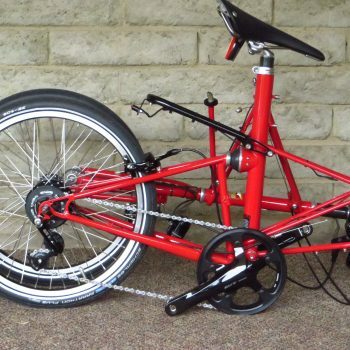 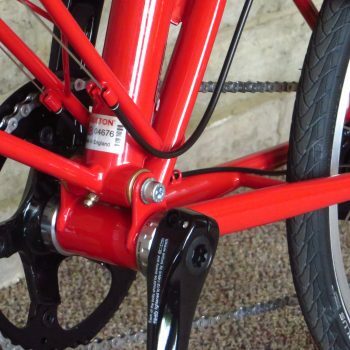 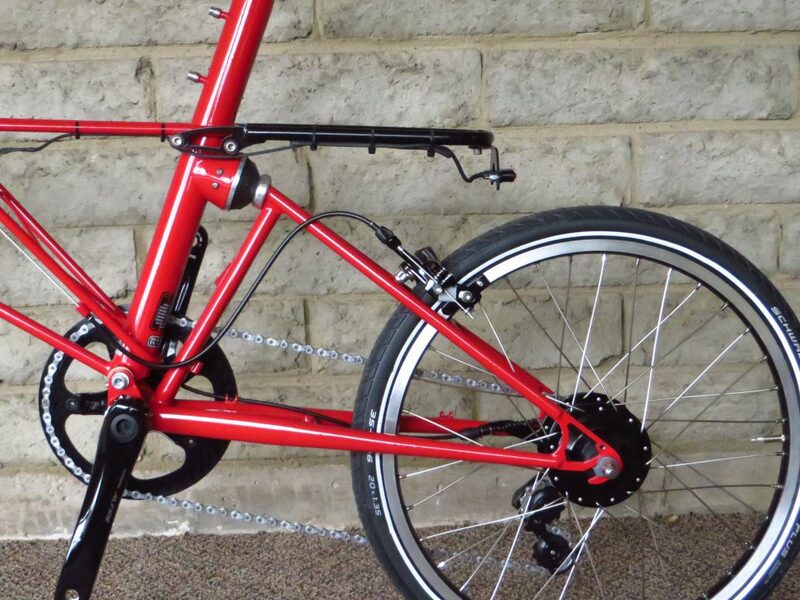 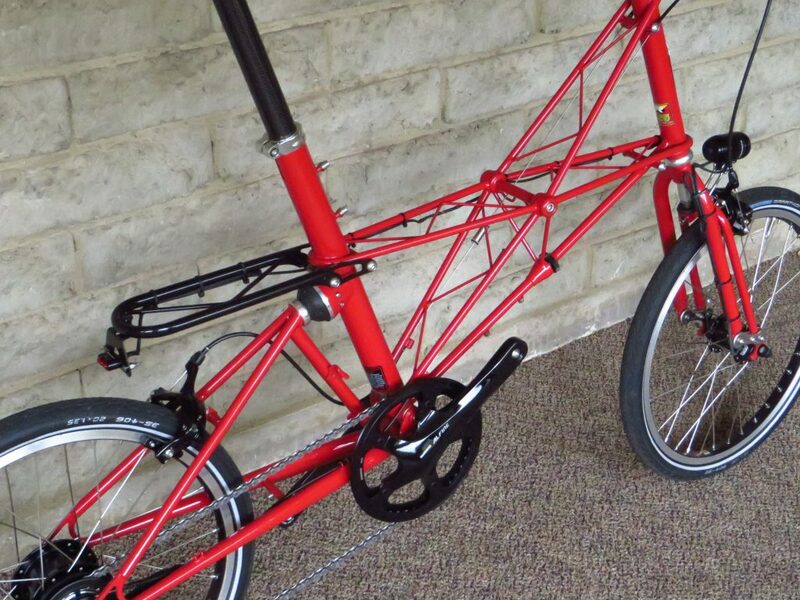 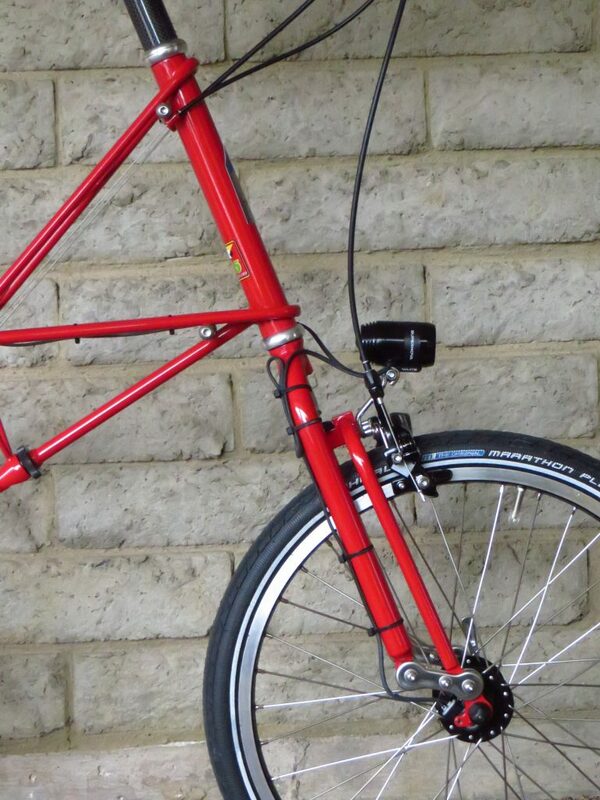 TSR Alfine 11 in Bright Red is a separable frame bike perfect for compact stowage and ease of travel. 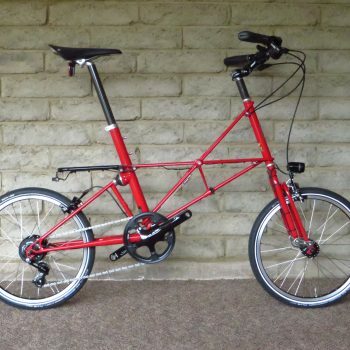 This unique Moulton TSR is equipped with Shimano’s high end 11 speed internally geared hub. 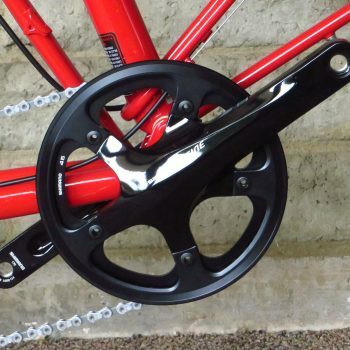 This hub provides a huge 409% gear range which on this set-up results in 24 to 99 gear inches, low to high, a range large enough to handle hills as well as quick fitness rides. 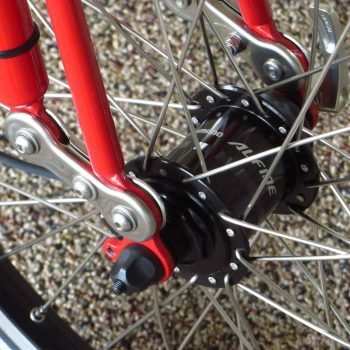 Just a great overall gear range! 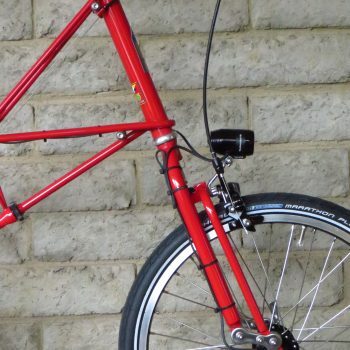 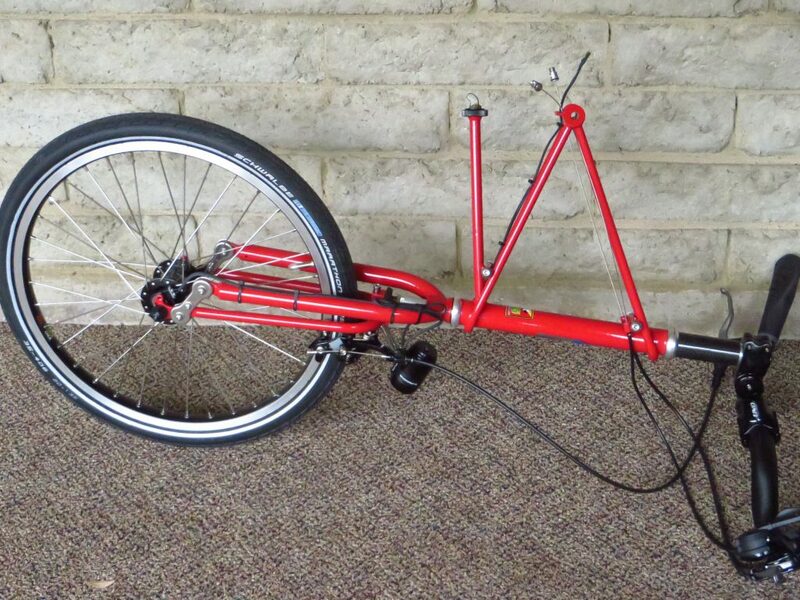 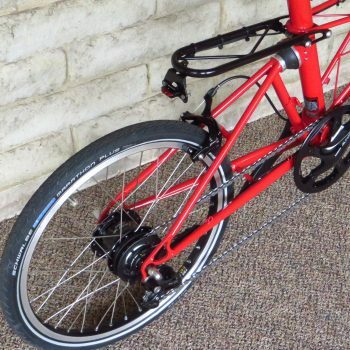 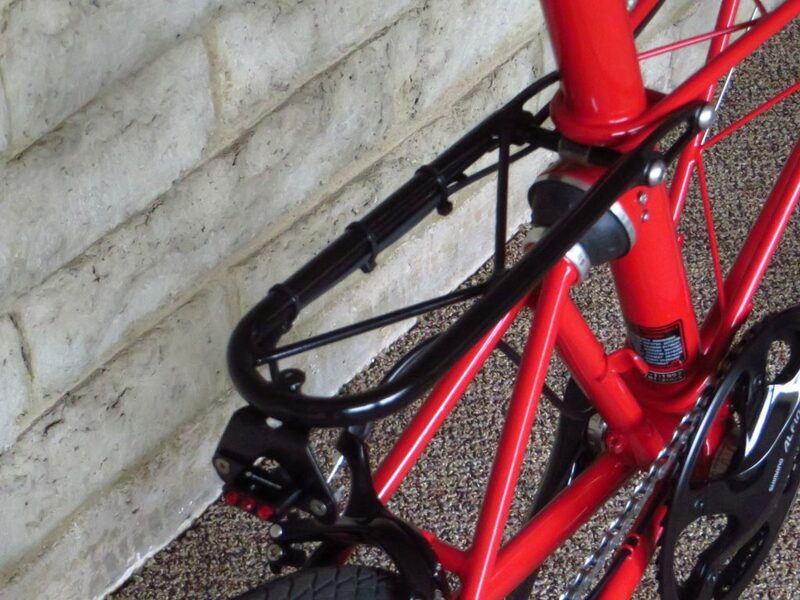 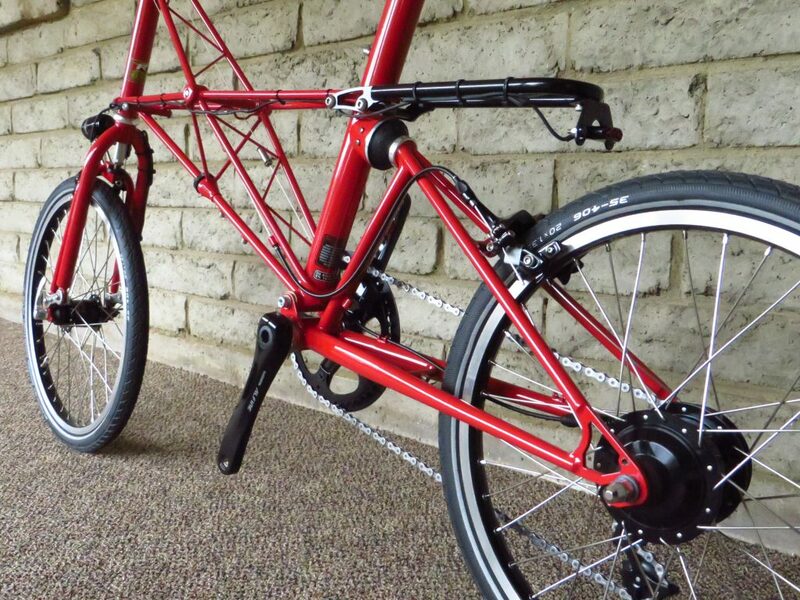 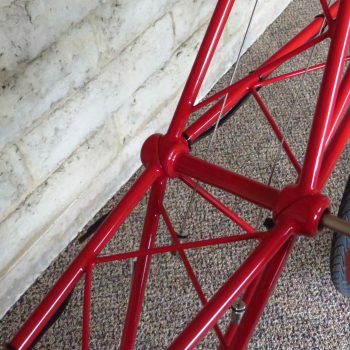 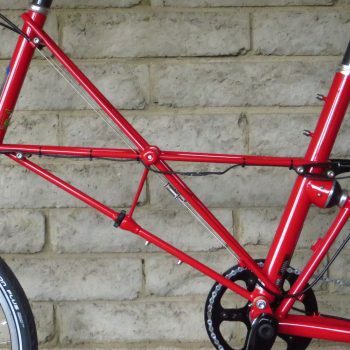 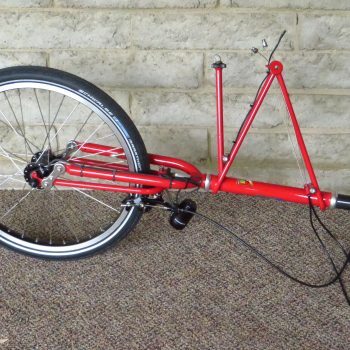 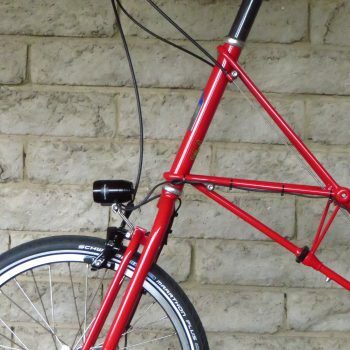 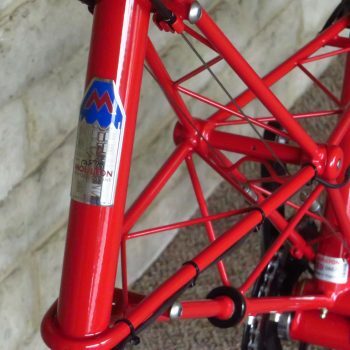 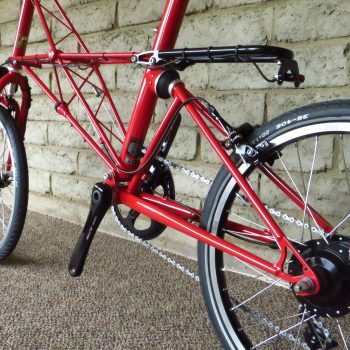 This bike is equipped with a TSR Rear Day Rack able to accommodate Moulton’s TSR Rear Day Bag. 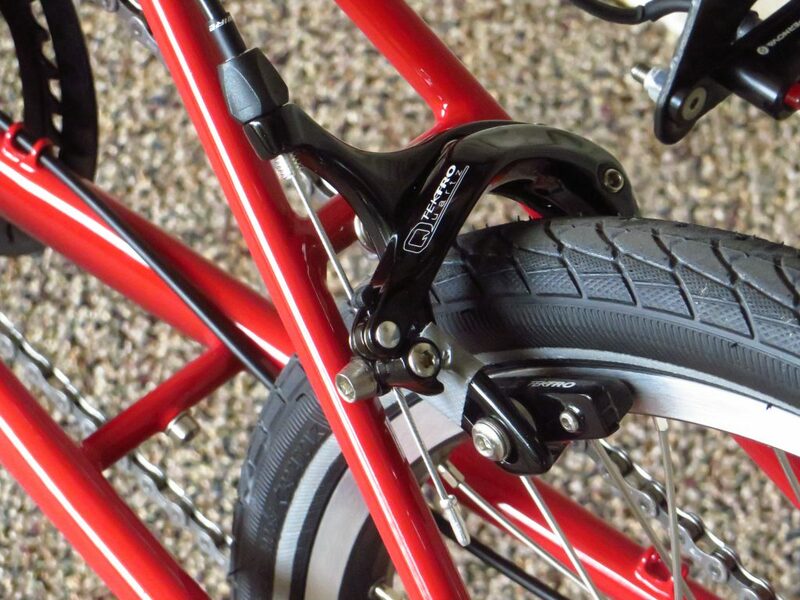 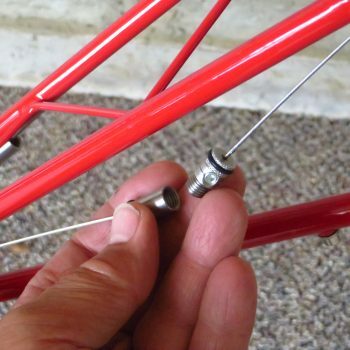 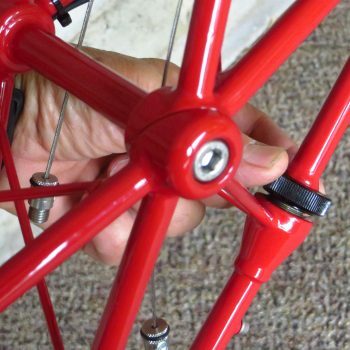 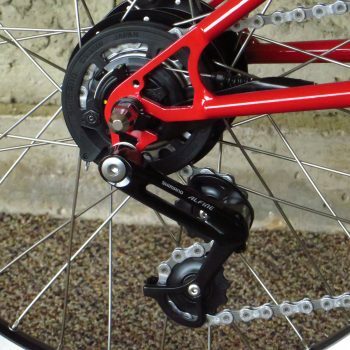 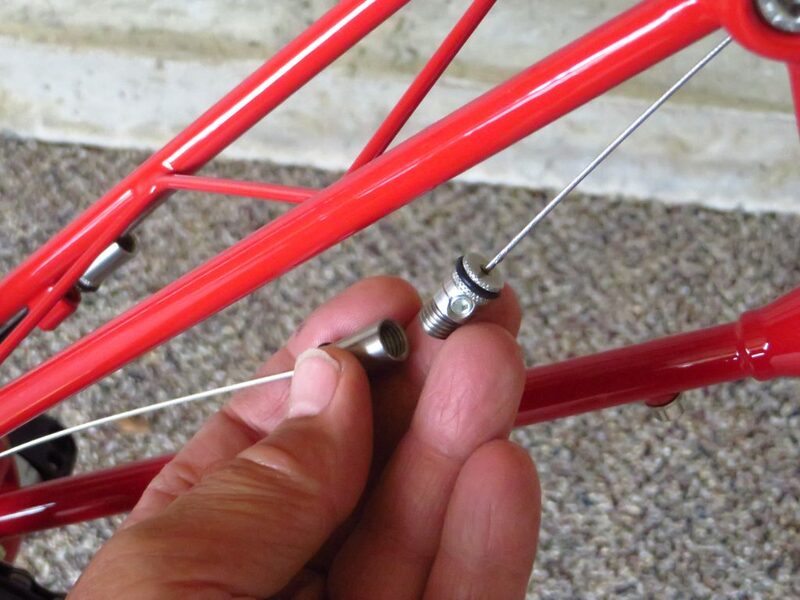 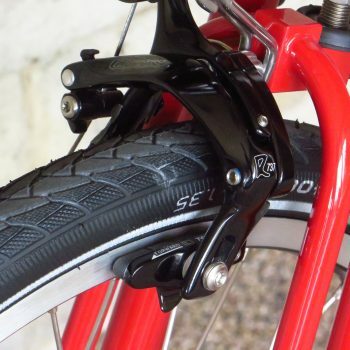 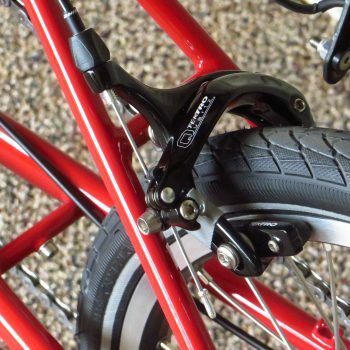 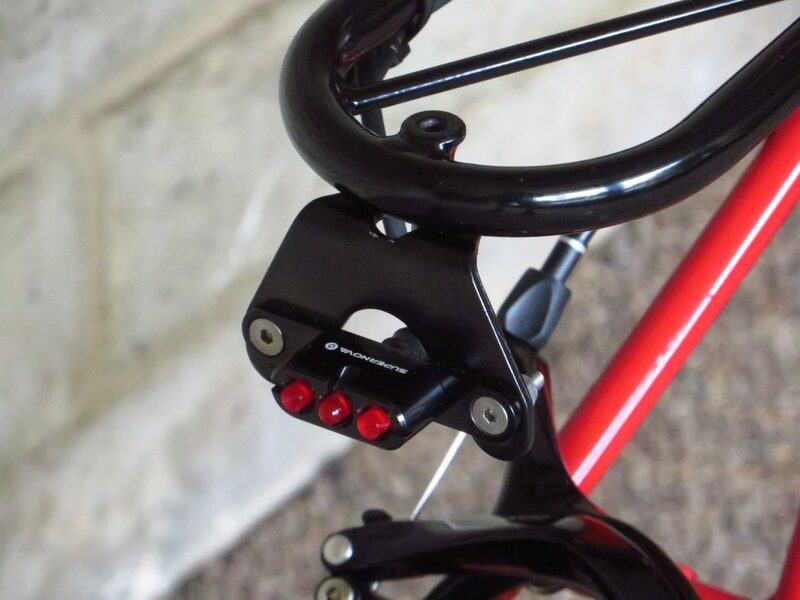 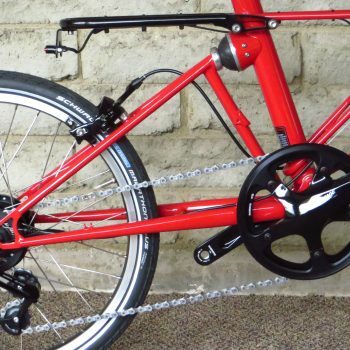 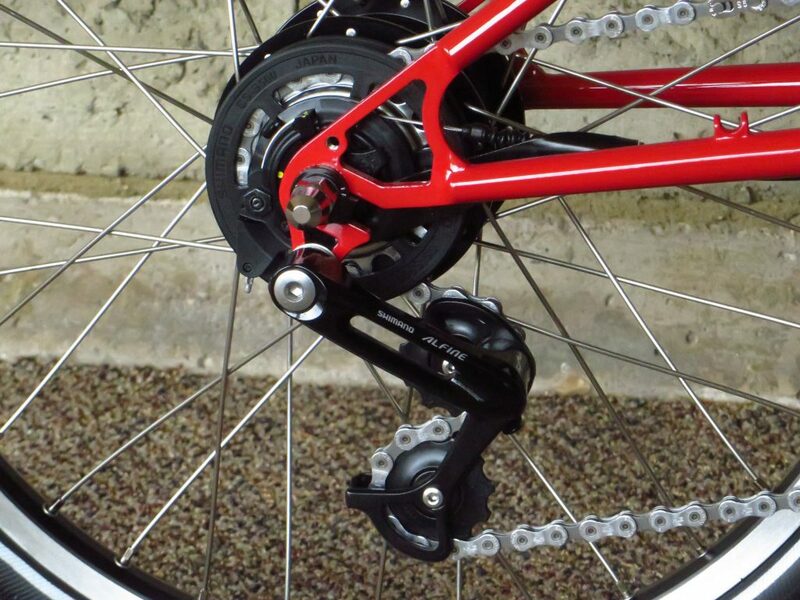 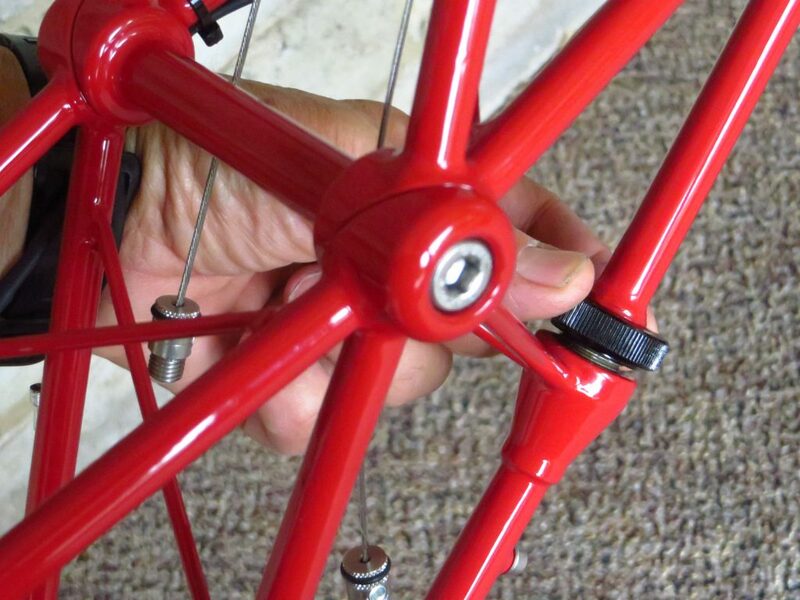 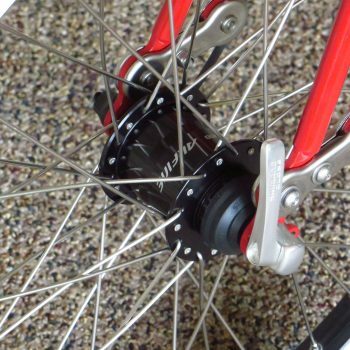 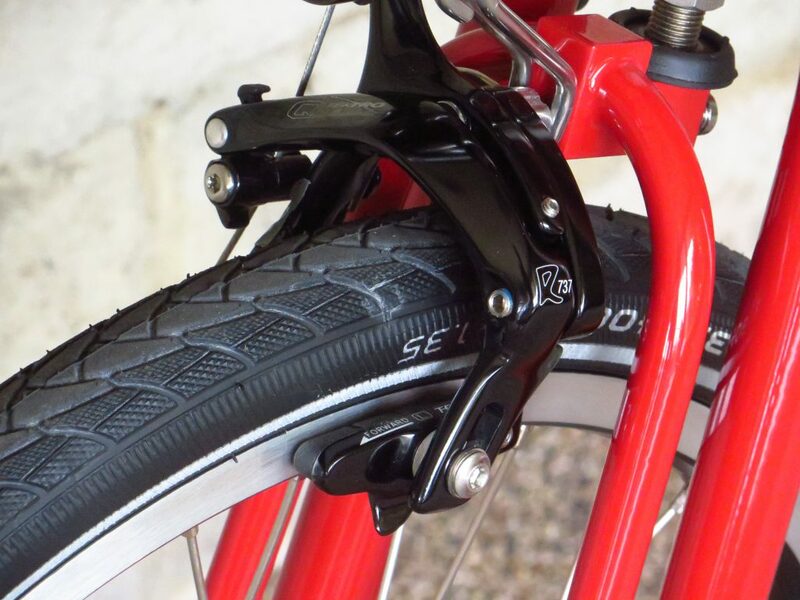 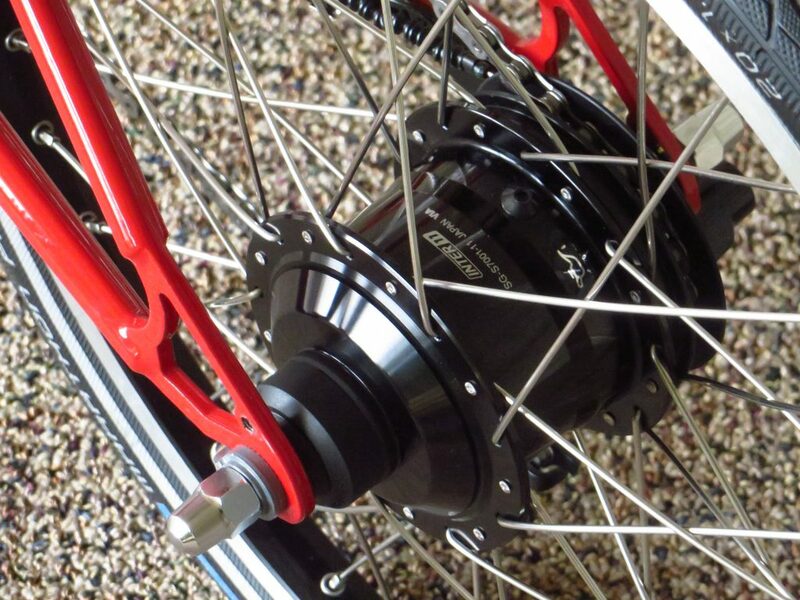 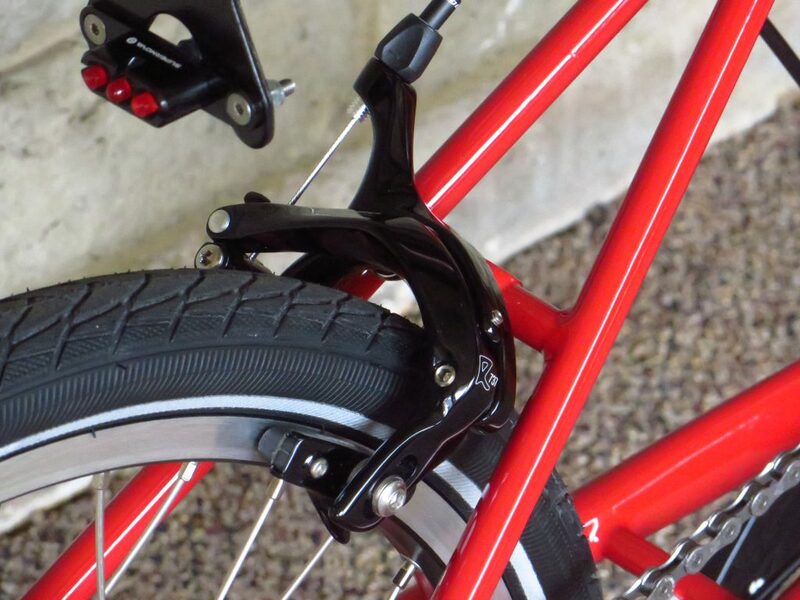 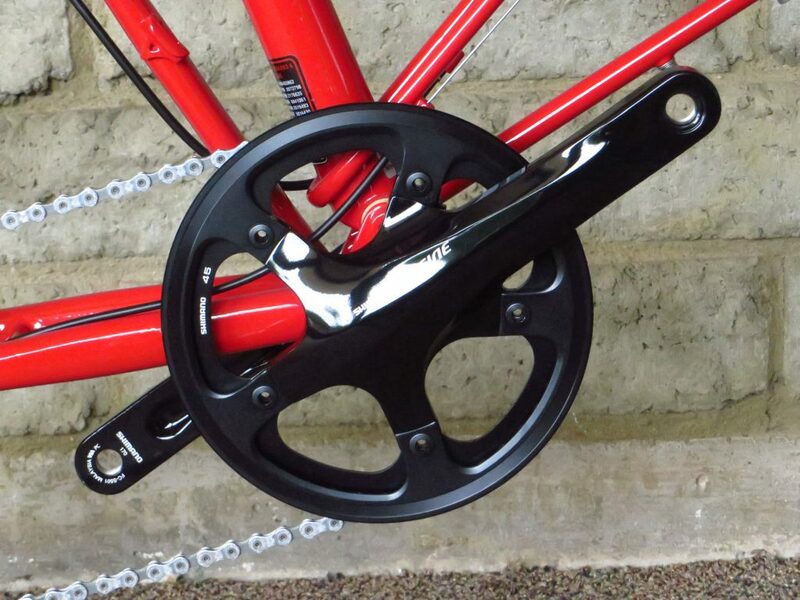 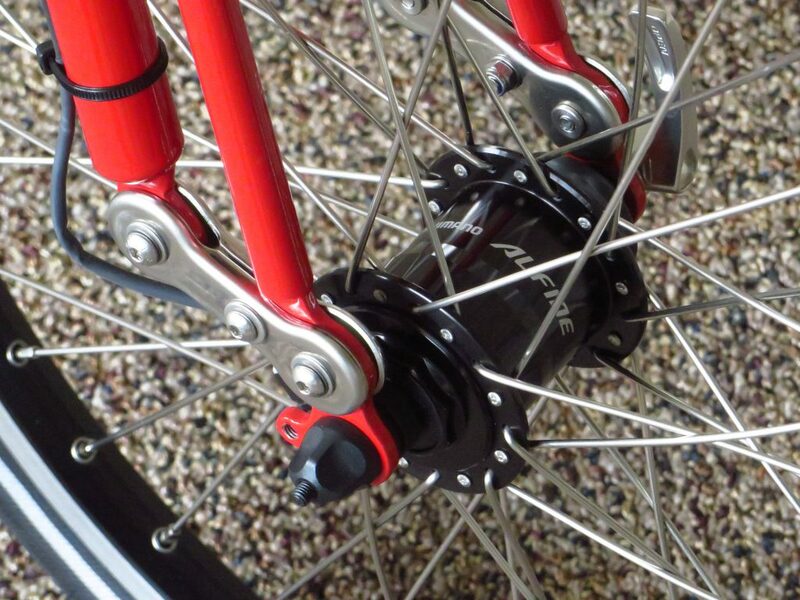 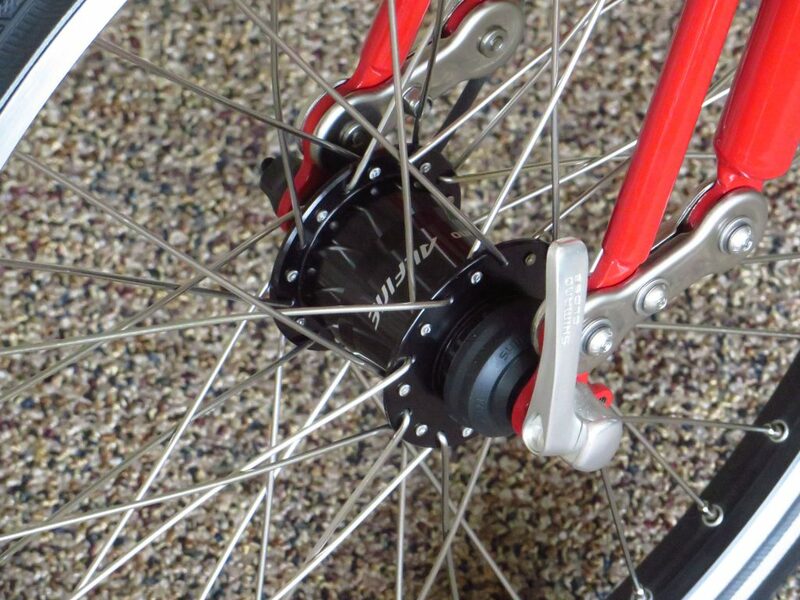 One advantage to an internally geared hub over a standard derailleur system is that it can be shifted while at a stop, great for shifting down to a lower start-up gear while waiting for the green light. 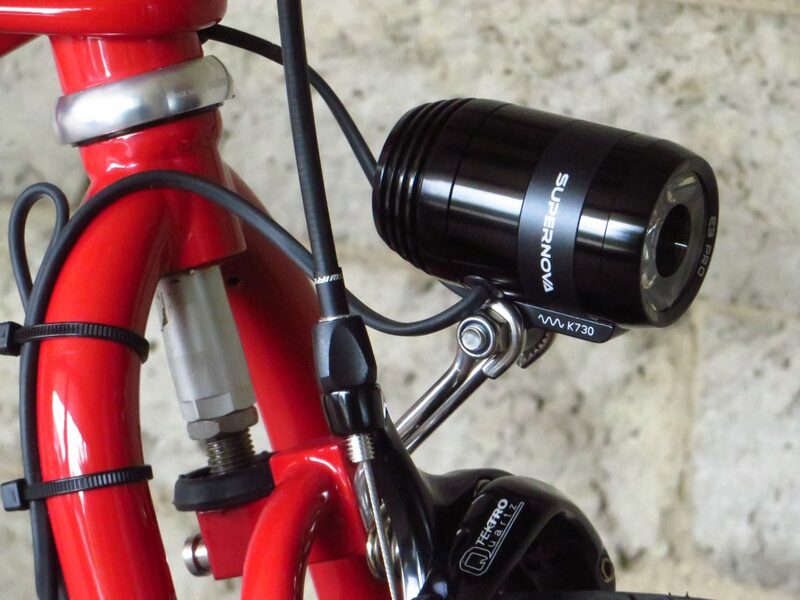 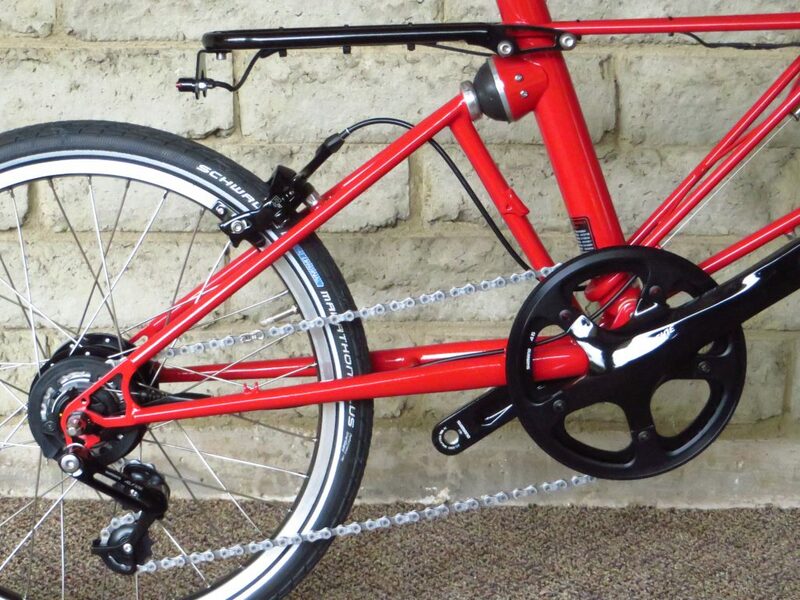 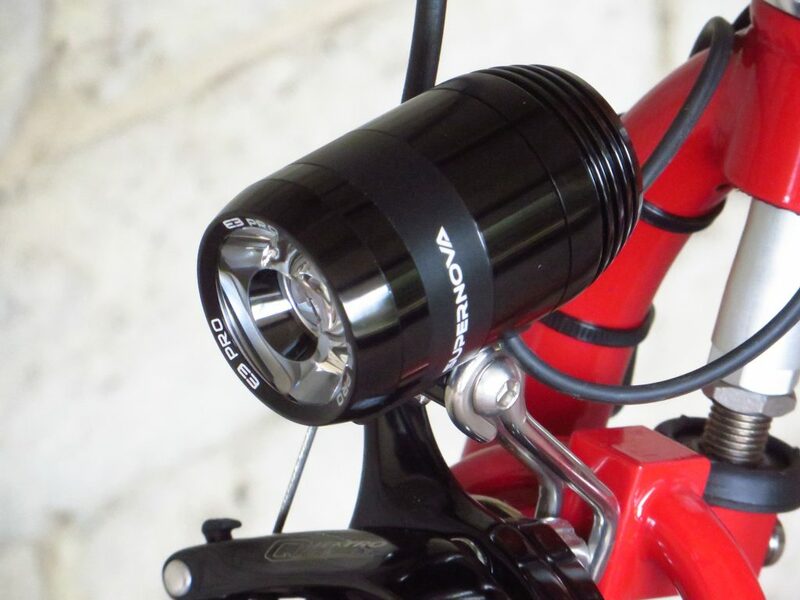 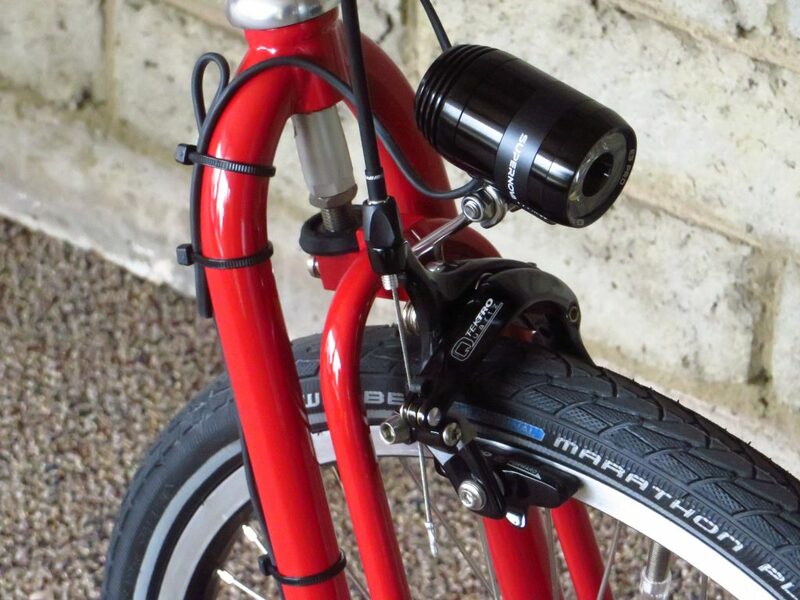 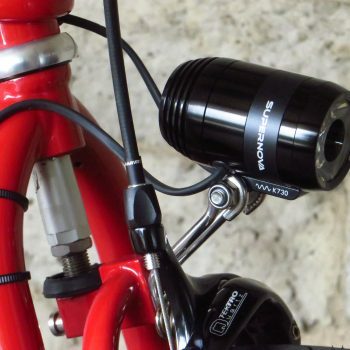 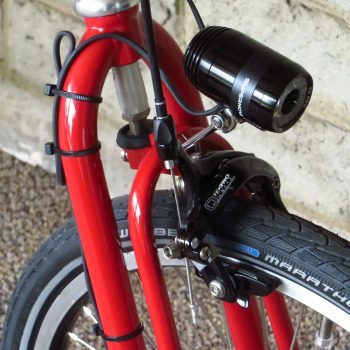 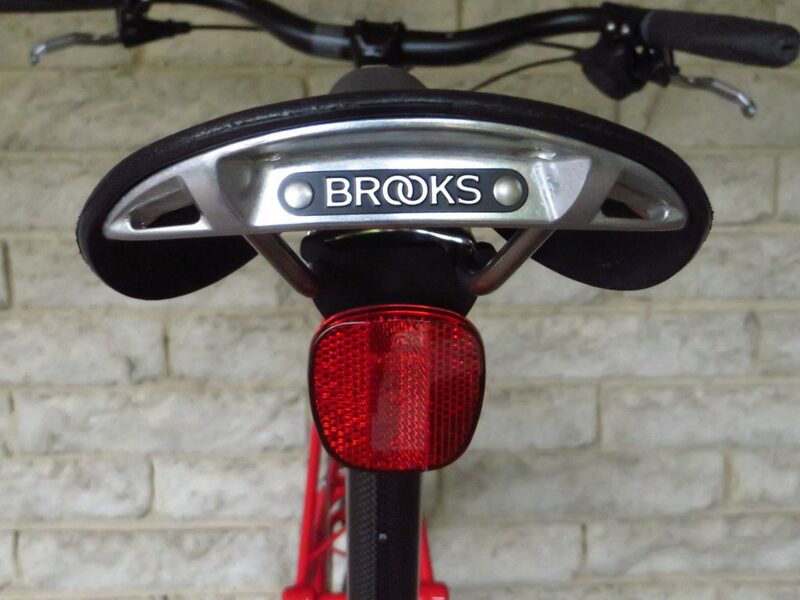 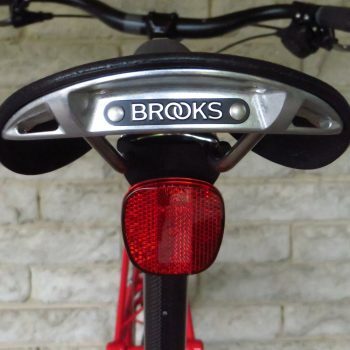 Speaking of lights, this bike comes equipped with a Dynamo Hub and headlight/taillight system. 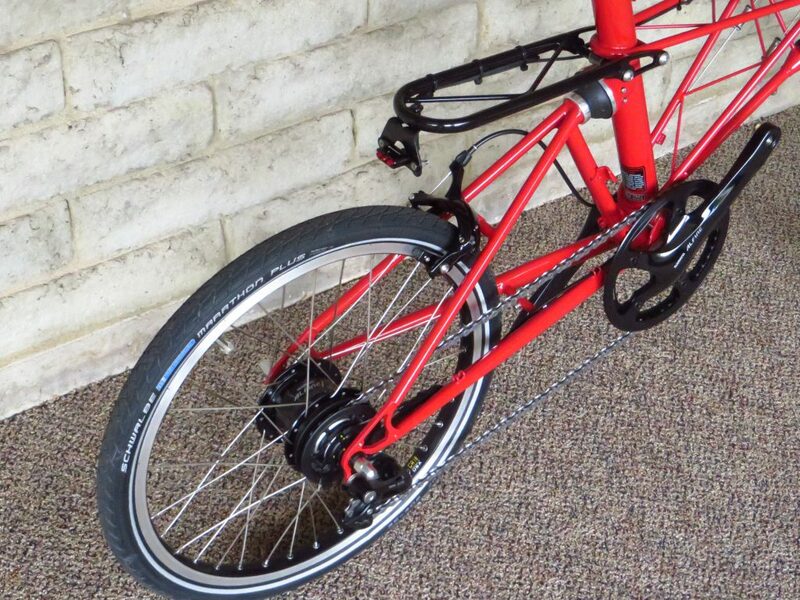 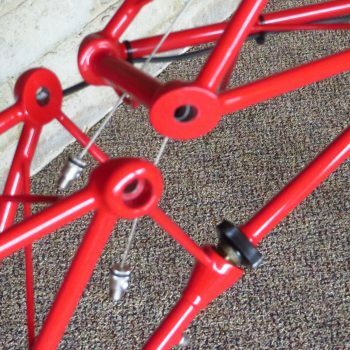 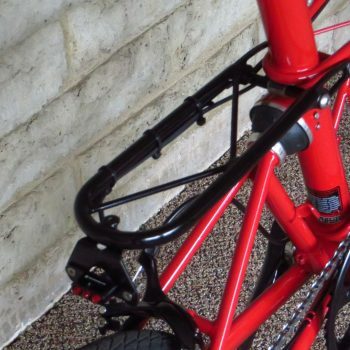 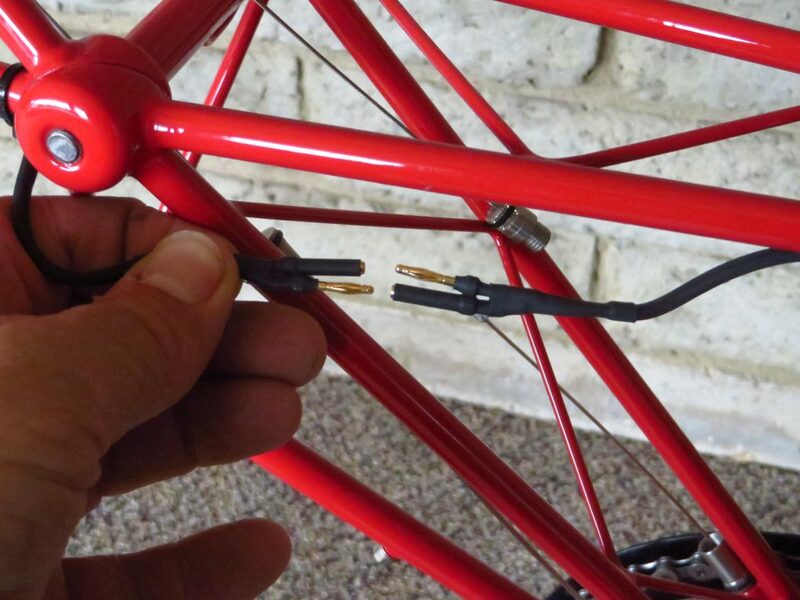 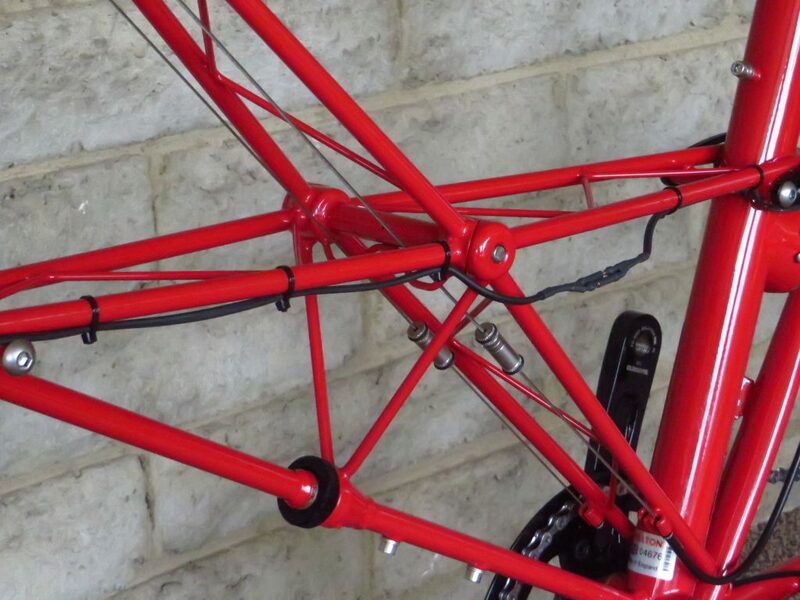 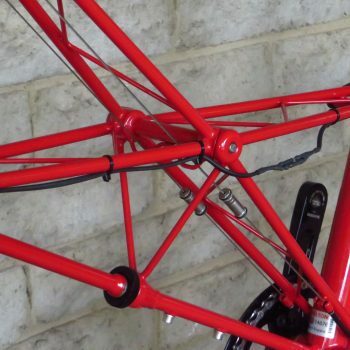 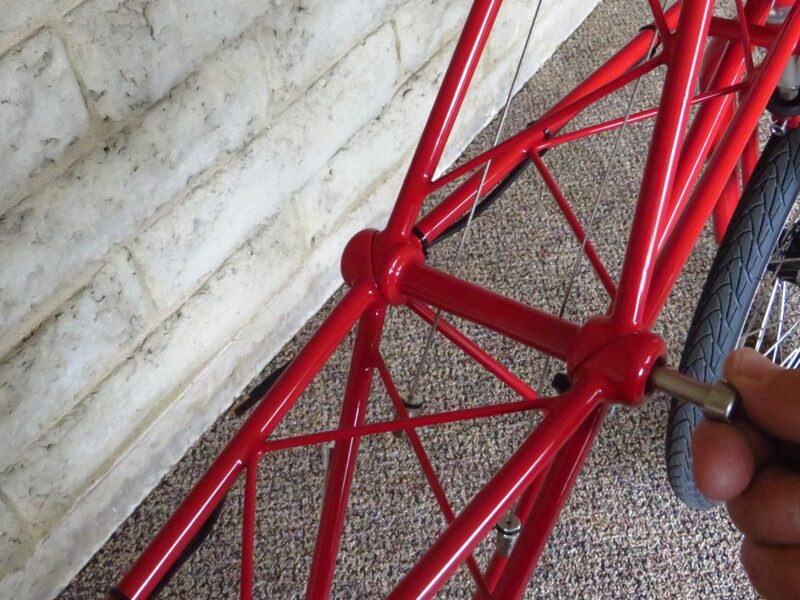 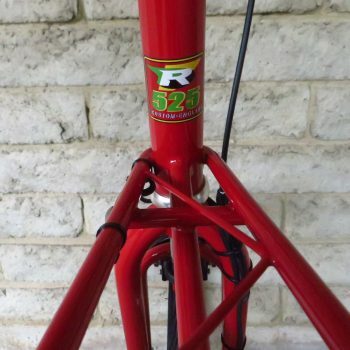 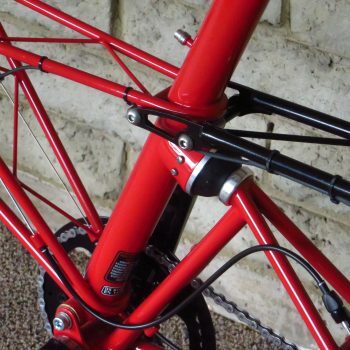 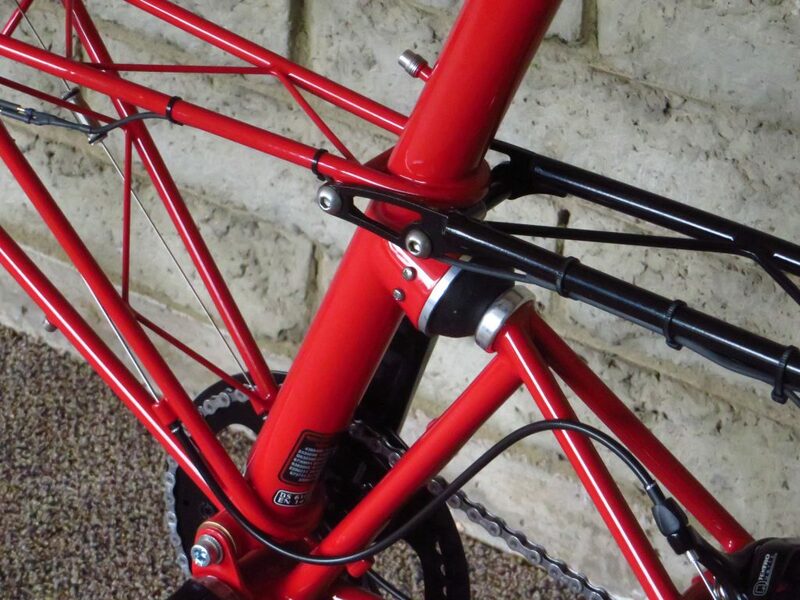 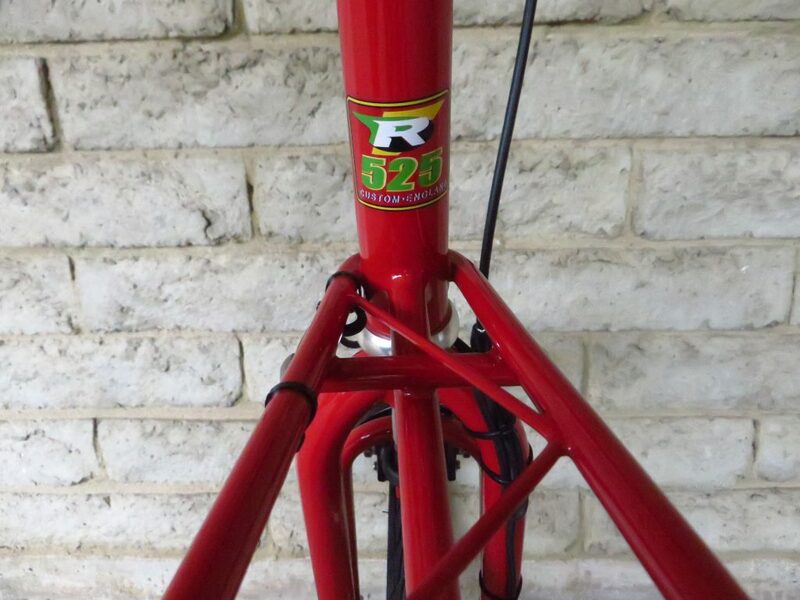 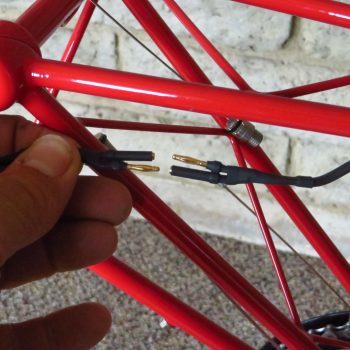 Wiring allows for separation of frame and will accommodate the TSR Large Rear Rack and Front Pannier Rack. 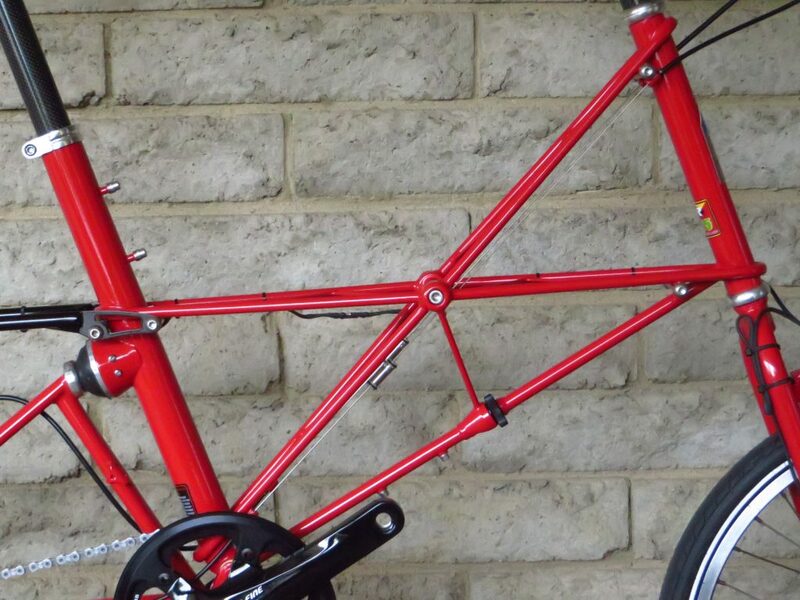 The Moulton is perhaps the best riding bike on the road today, no matter what size the wheels, smooth and responsive. 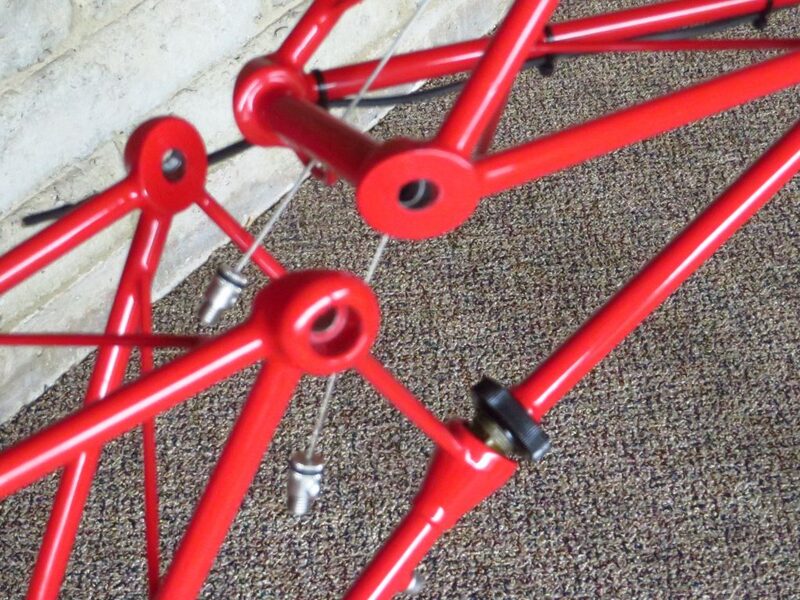 This is due, in large part, to the frame’s double suspension system. 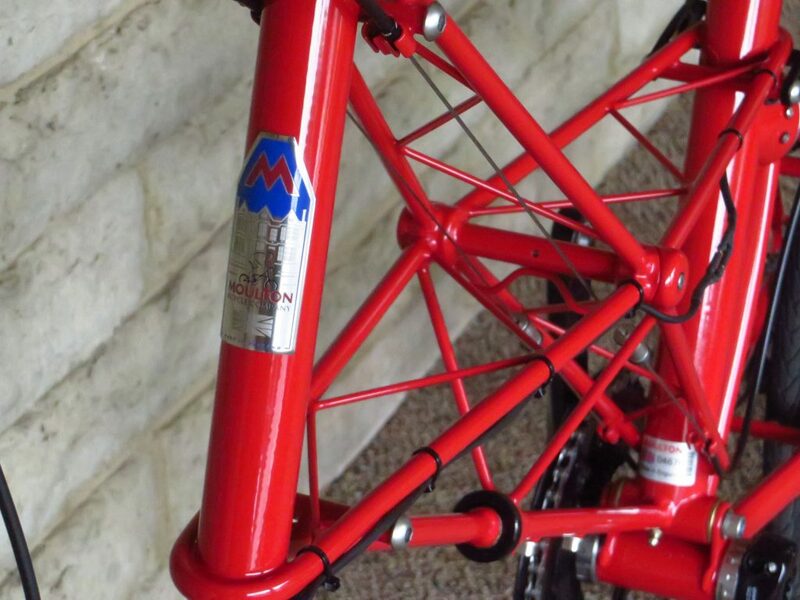 The Moulton’s tune-able suspension allows the advantage of strong, rigid wheels in combination with high pressure/low rolling resistance tires, while still providing a more comfortable ride than a conventional bike. 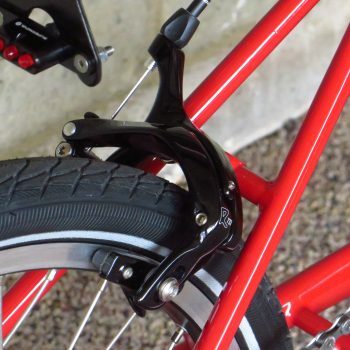 The suspension also maintains and improves traction on rough surfaces. 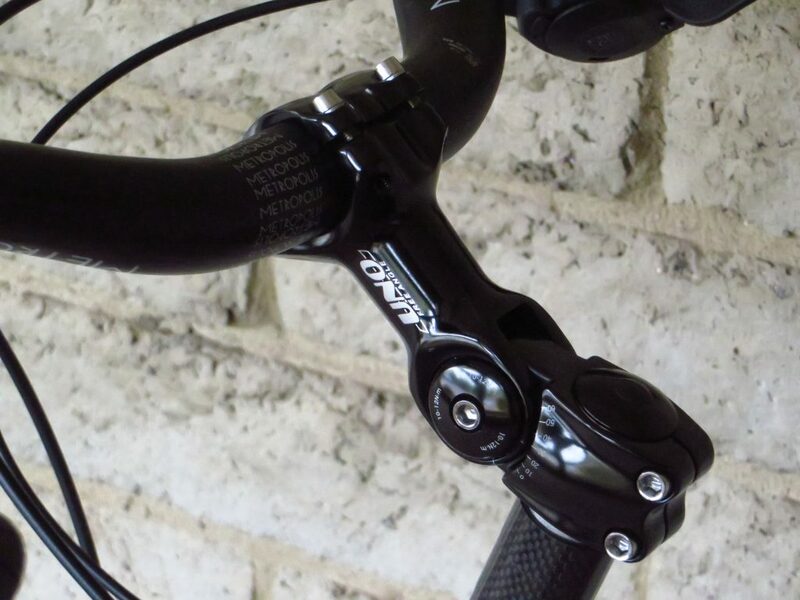 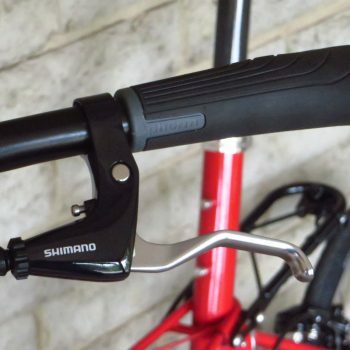 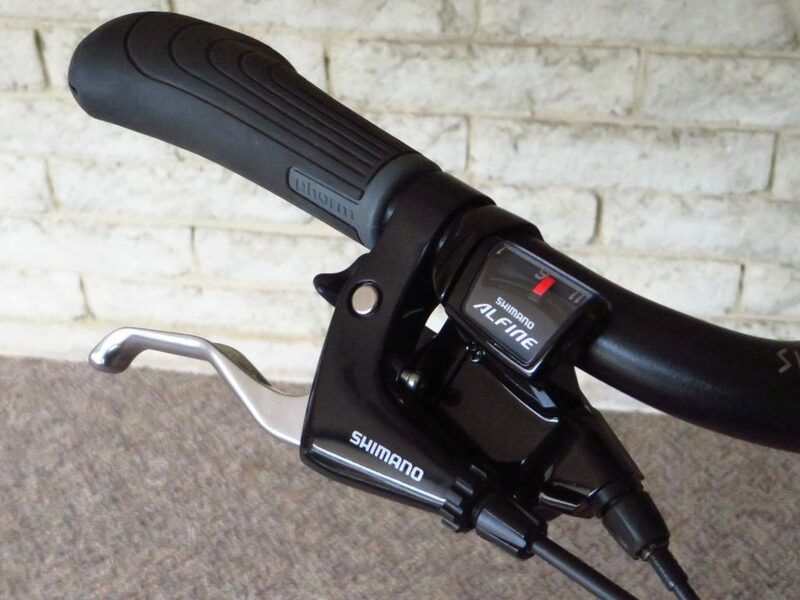 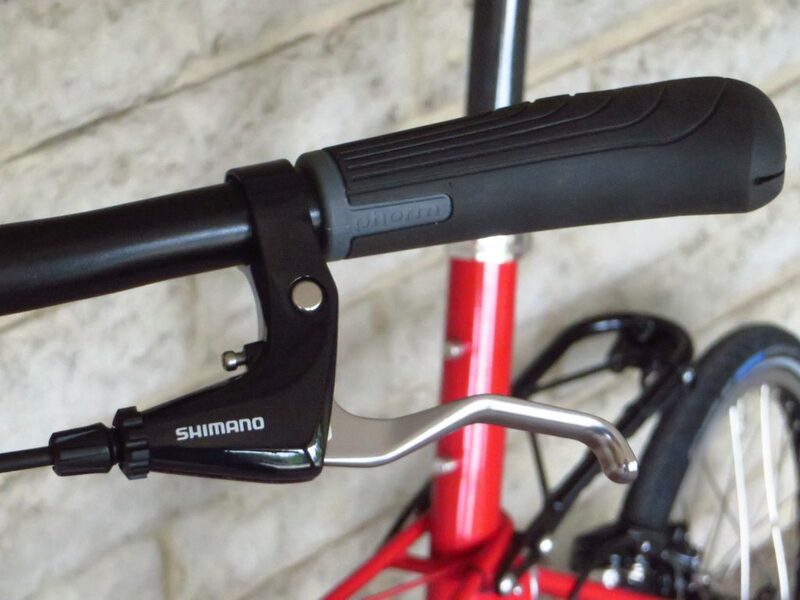 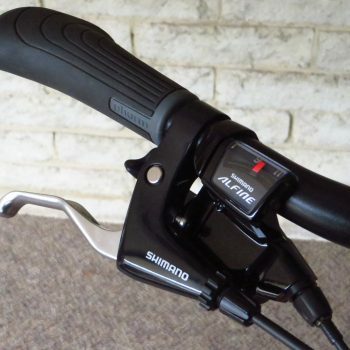 Spec highlights: Shimano Alfine 45t crank-set, Shimano Alfine trigger shifter, Alfine 11 speed I.G.H. 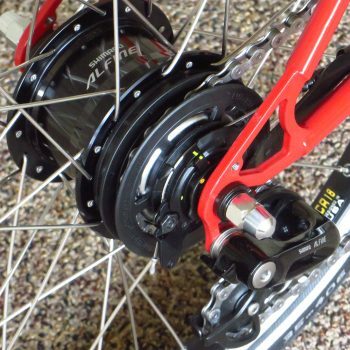 with 18t cog, Shimano R780 brake levers and Avid R737 caliper brakes, which are able to accommodate wider tires, and Shimano Alfine chain tensioner. 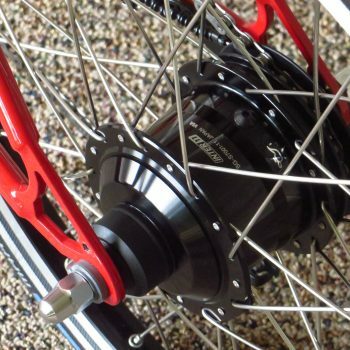 Wheels made up of SUN CR18, 36 hole, 20″ 406mm double-walled aluminum alloy rims laced with 14g stainless steel spokes, 36 per wheel and Schwalbe Marathon Plus 1.35 tires. 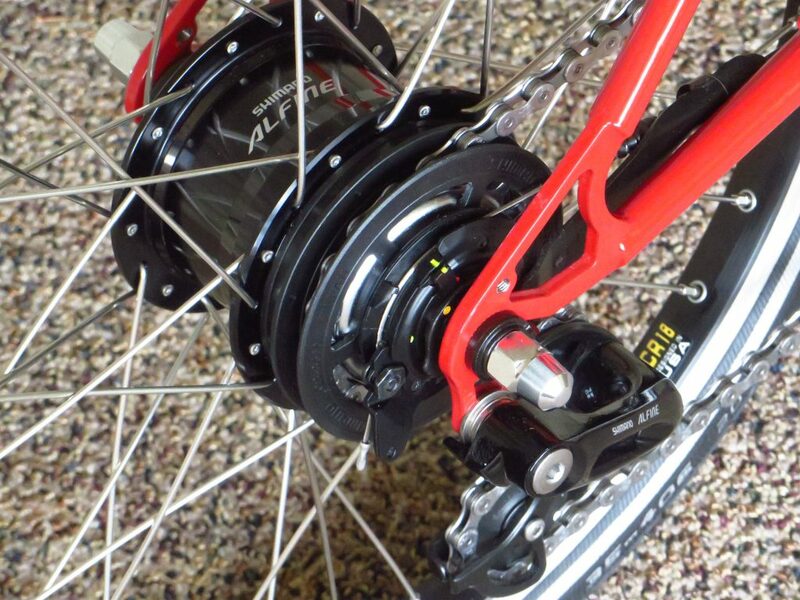 Front hub is Shimano Alfine dynamo hub. 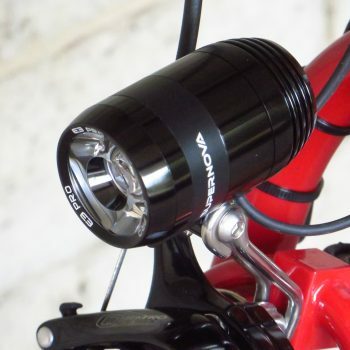 Headlight is Supernova E3 Pro 2 and tail light is Supernova E3 Tail Light 2. 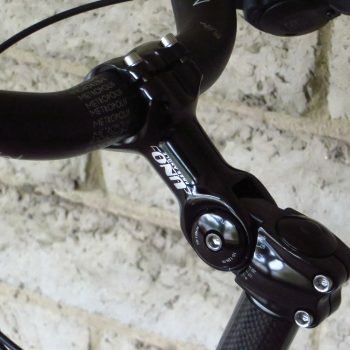 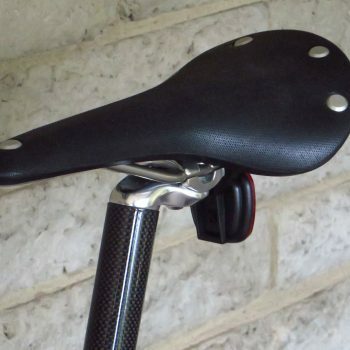 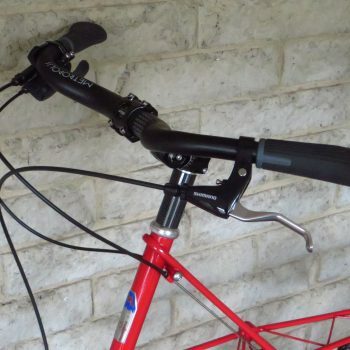 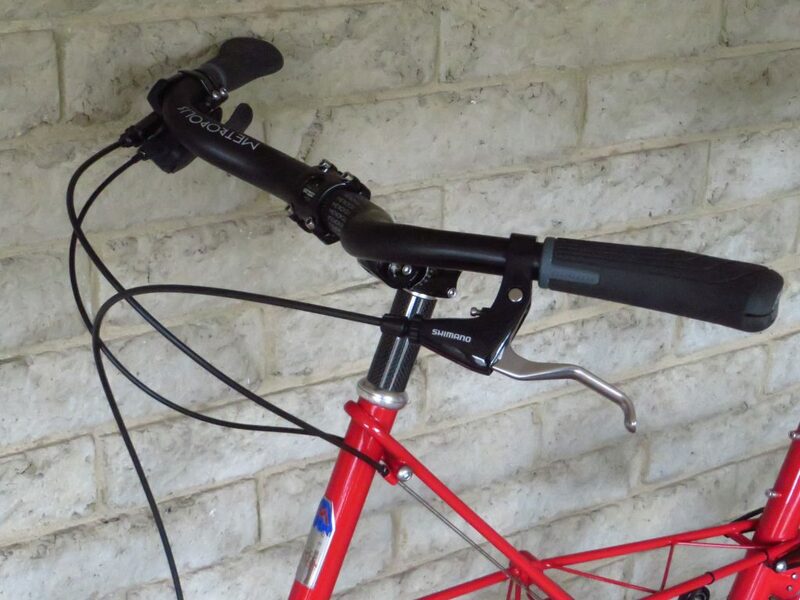 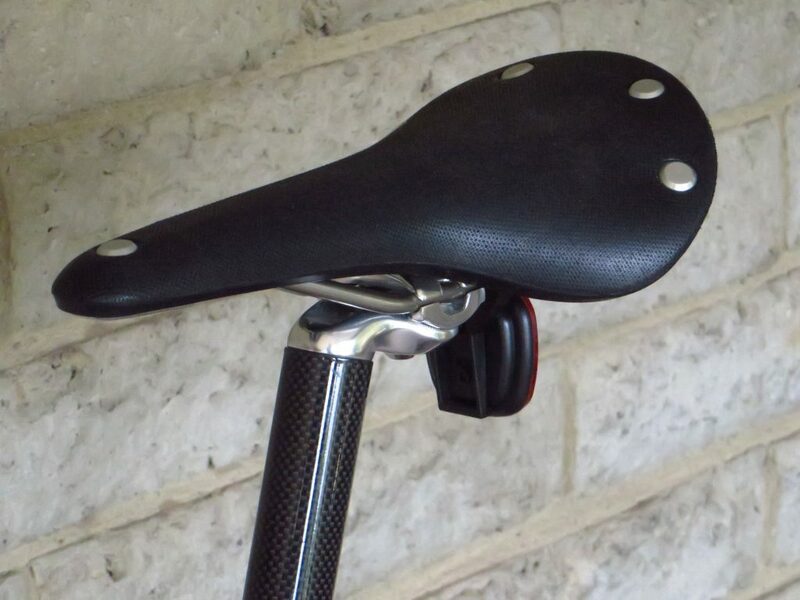 Bike comes complete with FSA Metropolis 31.8 swept-back handlebars, ergonomic grips, UNO adjustable handlebar stem, Moulton carbon seat post, and Brooks Cambium Black saddle. 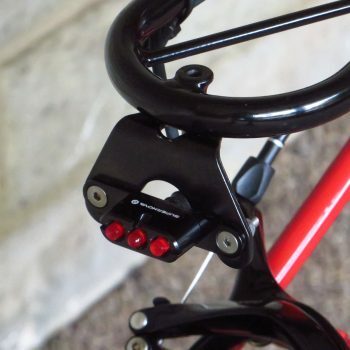 Pedals not included, but we suggest Lambda EZY Superior pedals.